The Whole Horse No. 42: AudioRide - Now Available From HHT! Just in time for Christmas, Happy Horse Training is offering you a new level of training assistance. AudioRide allows you to have your training manual right there while you are riding! And it's not just any training manual! It's one of the most comprehensive and practical guides available to riding a horse in the way which truly connects you to the horse's movement. AudioRide is a series of exercises recorded as audio descriptions, which are designed to listen to as you ride. 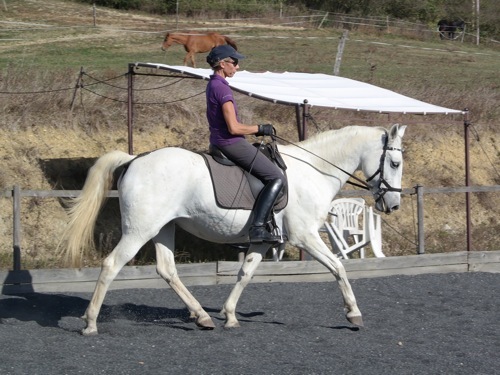 Three digital albums take you though each step of building your position, for a balanced and effective postural connection with the horse. 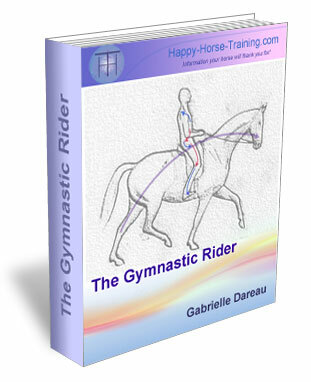 We have received numerous testimonials about Gabrielle's book, The Gymnastic Rider, and the common denominator is always how INSTRUCTIVE it is. There are many books about how to ride, but very few present the kind of specific instruction about what to do with your body when you ride provided in The Gymnastic Rider. Now we have taken these instructions and transformed them into exercises which are both illuminating and engaging. 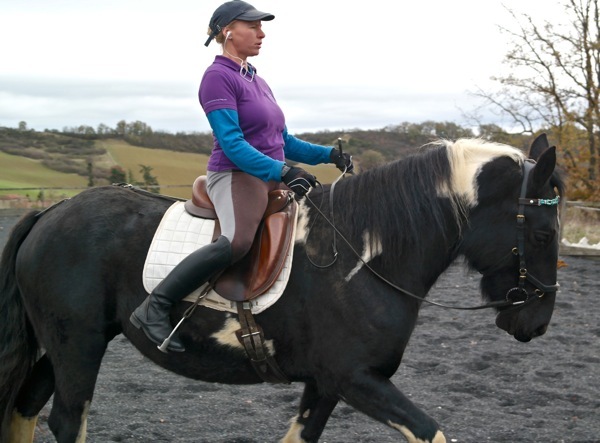 The series of exercises takes you step by step through the necessary postural development that enables you to ride your horse without force or frustration. Our passion is riding based on postural engagement - the magical feeling of becoming one with the horse's power while the movement flows through both of you in perfect balance and freedom. Most riders may only feel glimpses of this connection with the horse, because in riding there are a-hundred-and-one ways to take a wrong turning in your technique and miss out on this whole realm - especially when traditional riding instruction so often gives the wrong advice. If you dream of riding in TRUE harmony with your horse, without having to rely on harsh bits and spurs to get a good feeling, and without using either force or trick-training to communicate with your horse, then AudioRide and The Gymnastic Rider method are for you. 1) AudioRide is 100% controllable - you can repeat, pause and listen again as many times as you need to. 2) You are able to fully relax in your mind, not worrying about anything but the voice in your ear. Your performance is entirely your own business! 3) Time is on your side, you can listen day after day whenever you like, with no worries about getting the most out of your rare lessons. 4) The more impartial nature of the tapes actually has more of an effect of aligning YOU with correct riding, rather than continually focusing on your own personal faults. ★ Coming out first is the AudioRide Gymnastic Rider series which addresses rider posture in every detail, as well as how to apply that posture to straighten and engage your horse! ★ The voices are our own - Camille and Gabrielle Dareau. They are clear and concise instructions, easy to follow while getting to the heart of each aspect of how to ride. The recordings are professional quality, and available as mp3 files, which are flexible and easy to use. ★ When you buy AudioRide, you can download the mp3 albums straight away - simply drag them onto your device and you can start listening. ★ All you need is an mp3 player (e.g. 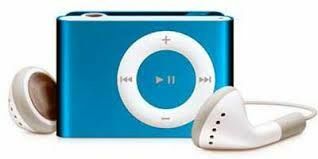 an ipod, smartphone or other mp3 device) and a pair of secure earphones, and you're ready to go! We are offering this free download 'Riding In The Now', which helps you to create the right state of mind at the beginning of your riding session. Our approach to riding is all about combining feel with a specific postural development that connects you with the horse in a profound gymnastic interaction. We can only develop this feel and connection when we stay in the 'now' - in the present moment - when we ride. 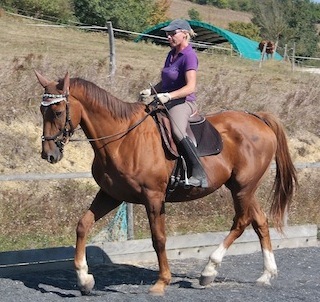 This is where we can grow a greater awareness of our own body, the horses body, and the dynamics of movement that connect them in riding. This exercise shows you how to center your mind in this way, before moving onto the more physical exercises of the AudioRide course.